Screenplay: Rick Jaffa, Amanda Silver. Starring: James Franco, Andy Serkis, John Lithgow, Freida Pinto, Brian Cox, Tom Felton, David Oyelowo, Tyler Labine, Jamie Harris, David Hewlett, Ty Olsson. In 2008 director Rupert Wyatt made his debut with British film “The Escapist”. It was a tense and excellently constructed prison drama that was seen by few. Thankfully, someone from across the pond took notice though and gave him a chance on a larger scale. He delivers big-time. Will Rodman (James Franco) researching a cure for Alzheimer’s takes home a baby chimpanzee after its mother – supposedly a failed experiment – is destroyed. 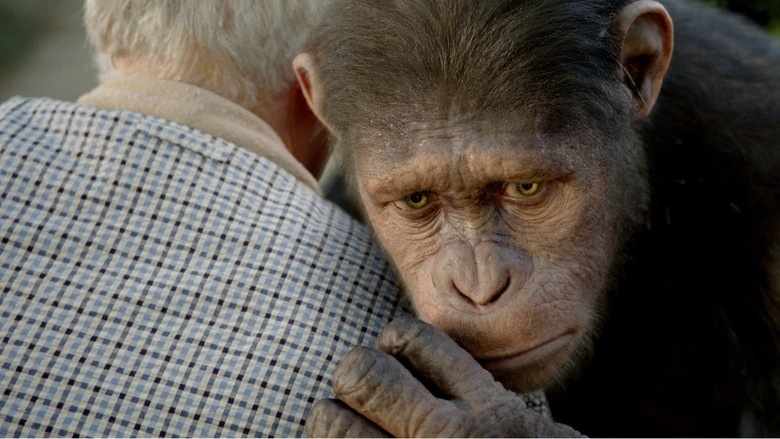 Caesar (Andy Serkis), the chimp, exhibits near-human intelligence, and comes to question his kind’s place on a human planet. After attacking a neighbour, Caesar is impounded and it’s here that he meets other apes and foments rebellion. This is old school entertainment, in classic B-movie style. It has the hero with a heart and the stereotypical corporate villain. I don’t normally go in for big laden special effects films of this kind but it’s hard to resist when they’re this much fun. Andy Serkis seems to be the actor in the forefront of motion capture these days. His credentials including, “The Lord of the Rings”, “King Kong”, “The Adventures of Tintin” and the forthcoming “The Hobbit”. This, being no less effective. In fact, it may well be his finest yet. He delivers a subtle and soulful performance. As mentioned, the near flawless special effects play a big part in this and are, quick frankly, outstanding. The biggest disappointment though, is the ending. It’s an obvious set-up for a sequel which leaves an unsatisfying conclusion and the feeling that you’ve just been teased. As pure unadulterated entertainment this is second to none. One of the most fun-filled films of the year and my personal favourite from the apes franchise. This entry was posted on February 8, 2012 at 8:51 pm and is filed under Action, Science Fiction, thriller with tags 2011. You can follow any responses to this entry through the RSS 2.0 feed. You can leave a response, or trackback from your own site. It wasn’t a film I thought I’d like and had put off for quite a while. Surprisingly, it drew me in.